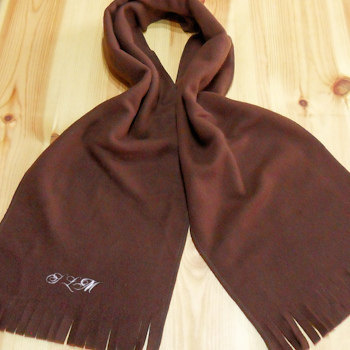 Brown polar fleece scarf made from soft easy care fleece adult size. Brown polar fleece scarf made from soft easy care fleece adult size. This scarf can be personalised with an embroidered name or initials as you may require. The scarf is made from quality polar fleece that is soft and cosy. Brown polar fleece scarf made from soft easy care fleece adult size. This scarf can be personalised with an embroidered name or initials as you may require. The scarf is made from quality polar fleece that is soft and cosy. Tassel ends and stitched sides. Nice long length for wrapping, knotting and folding. Comfortable fit for men or women.